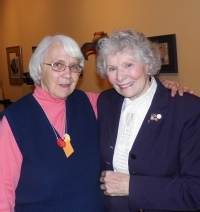 Margaret Jackson (left) chats with author Polly Craig on Jan. 8, 2013. Ms. Craig wrote the book A Metal for Dr. Mary. 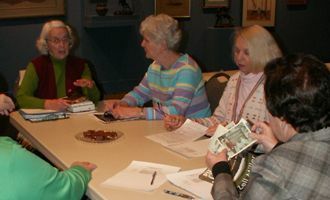 Members enjoy discussing a book. February 12, 2012, The Glory Days of WCHK by Marguerite Cline - Author will attend the meeting. April 12, 2011 - Trail of the Lonesome Pine b y John Fox, Jr.